Pic's the ultimate programmable Device, here are the basic serial servo controllers which I use. 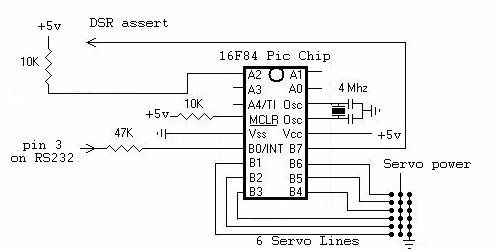 Home brew code can be prepared and tested quickly, and they are as flexible as EPROM's used to be. 3 of these give me 18 servo lines, plus 1 more with modified code to give latched, instead of dynamic outputs to control the drive power relays, 4 lines drive the relays, and the last 2 provide a 'POWER OFF NOW' clamp line to the motors. there are some links to good sources on the links page. They work well and in 2003, I will also be using an alternative to these, to collect status data and send it back, via another serial interface, to the controller. The controller almost treats these the same way a PC uses a serial mouse, if you think about it. The Schematic will be added here when is it tested and working this year. For information about the PIC chip family, and applications. I have included a link my favorite PIC archive site. ( see Links ).